Sandra McKandie from Keiran's Legacy is pictured on the 3rd anniversary of her sons death. Three years to the day since a Moray teen’s tragic death as he awaited an ambulance, his family say Scotland has failed to learn enough lessons. 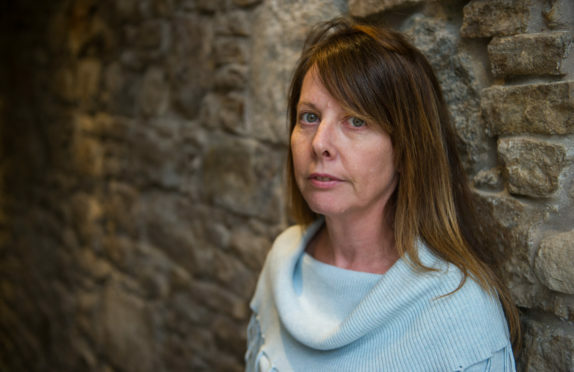 Sandra McKandie, who lost son Kieran in 2016, spoke out as shocking statistics obtained by the Press and Journal revealed Moray ambulance crews regularly fail to meet target response times. They took longer than the recommended eight minutes in more than a third of life-threatening cases in Elgin, Lossiemouth, Fochabers and Forres in 2017. And the failure to meet response targets in 36.82% of cases was an increase on 2016, when the figure was 34.08%. Those figures have dismayed the McKandie family, with Sandra and Gordon McKandie having dedicated themselves to improving the chances of survival for people across Scotland since the death of Kieran. He was killed after being hit by a car three years ago today. An ambulance took more than half-an-hour to reach him. The McKandies’ have battled hard to try and avoid a repeat of the circumstances, calling for greater coordination of emergency services and working to fundraising for defibrillators to be installed in key Moray areas, as well as holding CPR classes in schools. But Mrs McKandie said she was “appalled” that the response target had not improved, despite their campaigning. She said: “It is three years ago today since Keiran’s accident and I’ve raised this at government level but still things are not changing. “We’ve tried to do this as a family but while lives have been saved, response times have not improved. “It is almost like we are waiting for something like this to happen to another family, which would be appalling. The official data showed that in 2017, 215 out of 584 “immediately life threatening (ILT)” incidents in Moray were “out of performance” which means the ambulance took longer than eight minutes to get there. The figures also highlighted the longest time taken to respond to a life-threatening call in 2018, with one patient being forced to wait over 34 minutes for an ambulance. A “surge in demand” was given as the reason. The McKandies’ have been pushing for more dual response within the emergency services, which would allow any vehicle with life-saving equipment to respond to an urgent call. This scheme was trailed by the fire service in Turriff and Maud, leading to 40 life-saving interventions. It was about to be rolled-out in Elgin until it was halted by the Scottish Fire Service as its services underwent a restructuring. Addressing the new figures, a spokesman for the Scottish Ambulance Service said: “Our new triage system prioritises patients whose lives are at risk and we ensure we get the quickest response to these patients. “For less ill patients, we get the best response to them based on their condition, not necessarily the nearest or quickest and this approach has led to a 43% increase in the survival rate for our sickest patients. “Our hard working crews care for patients in some of the most remote parts of the UK, but even then, they reach 75% of patients in under 10 minutes and 96% within 20 minutes across the whole of Scotland. Sandra and Gordon McKandie founded Keiran’s Legacy following the death of their son, who was struck by a car while mountain biking on the outskirts of Elgin. They have devoted themselves to raising awareness of importance of defibrillators and have helped to fundraise to install vital devices around Moray, including in remote areas like Garmouth and Kingston. The charity also visits schools to offer CPR lessons to pupils in a bid to make sure everyone who graduates is able to save a life if they are called upon. They are also on a mission to make sure every school in the region has a defibrillator installed, with the equipment already in place at Lossiemouth and Elgin High Schools and at Elgin Academy. Ten defibrillators carrying Keiran’s name have been carried in police cars across the north-east of Scotland since February last year, following a fundraising drive. Figures obtained by the Press and Journal revealed that the equipment had been used 11 times in 2018. All of the police car defibrillators, which are based in Elgin, Aberdeen, Inverurie, Mintlaw and Stonehaven, bear the name of the charity set up in memory of the teenager, Keiran’s Legacy, as well as nickname given to him by his fellow cyclists, “KDAWG”. As part of the pilot scheme, training has also been provided to road policing officers so they can use the heart-start equipment if they arrive first at the scene of an accident. Sandra McKandie said she was proud of the impact Keiran’s Legacy has had on the region. She said: “Lives have been saved and we have been busy educating school pupils on vital skills they can take with them when they leave.